Envied are the children whose birthday parties include bouncy castles. But before peeling back the velcro-lined doors to join their friends inside, kids probably aren’t thinking about their safety. Unfortunately, many injuries, suffocations, and even some deaths have occured because of inflatable bounce houses. 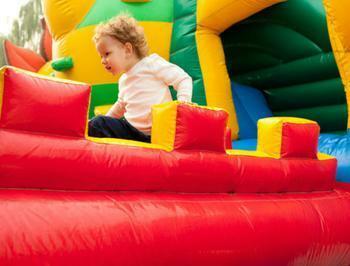 One of the main causes of injuries associated with inflatable bounce houses are sudden deflation events, which can be caused by anything that detaches the blower from the castle. Now, a device that could help warn children, parents, and operators that an inflatable bounce house is at risk of deflation may be declared mandatory. The blower safety device has been on the market for years -- but now, it's use is about to become legally required. Previously, it was up to inflatables manufacturers to set their own safety guidelines. Now, N-flatables has announced that the United States Consumer Product Safety Commision (CPSC) and the ASTM (an international standards organization) have offered input on creating new safety responsibilities for manufacturers, operators, and those who use inflatable devices. The new standards are still pending finalization, but they are expected to include a requirement that calls for mandatory use of a device that warns of a power loss or deflation event. Via siren or flashing light, the device would instantly warn those inside or near the bounce castle that a deflation event is about to occur. As previously mentioned, this device has already been created -- it’s called the Watchdog Blower Siren. Bounce castle rental companies, however, rarely use it. The new safety regulations would make the use of a blower safety device with audio/visual alert mandatory.